Lessons to "take home" in a sense, from reading select Qur'anic surahs, and understanding the message to improve oneself. Around 50 surahs are highlighted, with important messages explained. 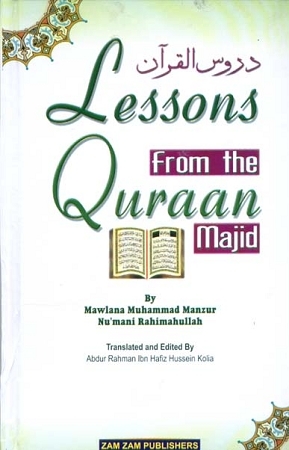 This book is a compilation of lessons on Tafsir that were delivered by Mawlana Muhmmad Manzur Numani Rahimahullah and published in the monthly Al-Furqan. The author was renowed for his remarkable oratory and literary skills. He has the knack for simplifying complex issues and presenting in a lucid manner.